Spanning over 2,900 square miles of Pennsylvania's highest mountain tops, rolling countryside, and sparkling waterways, the Laurel Highlands is located in the southwestern corner of the state about a one hour drive east of Pittsburgh. The region is home to some of Pennsylvania's most iconic sites, thousands of acres of pristine federal and state parkland and some of the prettiest scenery in America. From Frank Lloyd Wright's Fallingwater to the Flight 93 National Memorial to the Great Allegheny Passage Rail-Trail and Idlewild & SoakZone - voted the Best Kids' Park in the World! 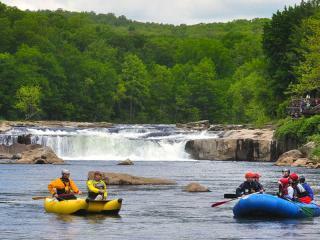 The Laurel Highlands is one of the Mid-Atlantic's most scenic and diverse destinations. Find out what these awesome writers have to say about this expansive and impressive region. Laurel Highlands, PA Delights: Mountains, Waterfalls, and Sunsets! By Judy Ellich for Somerset Daily American Officials report that numbers are up in a key Somerset County industry — tourism. By Beth Harpaz for Associated Press For travelers, the new year opens up a whole new world of places to go and things to do. Chicago Tribune: by Cindy Decker Touring three Frank Lloyd Wright houses in two days will make a visitor sure of two things.